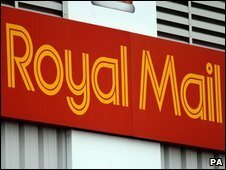 Royal Mail said it had launched an "urgent investigation"
A Dundee postman has been suspended after it was claimed he gave his spare uniform to a member of the public and let him to do his mail rounds. It was reported that the fake postie went into the office in Tayport, Fife, collected the mail, then delivered it. Royal Mail confirmed that a postman from the Dundee central delivery office had been suspended while an "urgent investigation" is carried out. A spokeswoman said disciplinary action could be taken. The Royal Mail spokeswoman said: "Royal Mail can confirm that a postman from Dundee central delivery office has been suspended while an urgent investigation is carried out into an alleged incident at the Tayport delivery office and appropriate disciplinary action will be taken. "The safety and security of mail is of the utmost importance to this business and Royal Mail will take whatever action is necessary to ensure the security of the mail is not compromised in any way."